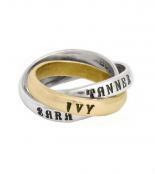 The triple band name ring is perfect for the mother of three. Have your "babies" forever wrapped around your finger! 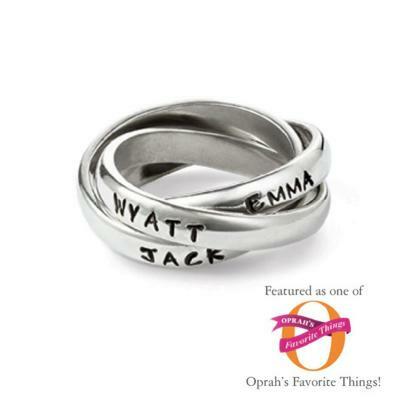 This is one of our most popular name rings and was picked as one of Oprah's Favorite Things! the gift can be wrapped in our signature lavender and rosebud packaging! 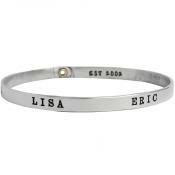 The mother of three will adore this triple ring with her kid's names on each band. This mother's ring with three interconnecting bands creates a one-of-a-kind stamped piece of jewelry. 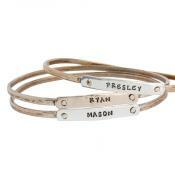 The most popular way to personalize the triple ring is one name stamped on each band. 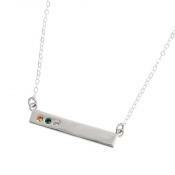 But you can also use your imagination and include nicknames, dates or any word or phrase that is meaningful to you! 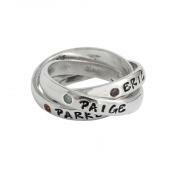 Create a stamped custom ring with whatever combination of names and words. I started with a triple ring with my grandchildrens names. I added a double ring with my children's names. I love wearing them together. I was so happy with mine that I got a triple ring for my daughter. Nelle and Lizzy were the best and helped fitting all of the names on the rings. LOVE! I love my ring, but I'm heartbroken that I can't wear it. I had my finger sized, but since it's 3 rings combined, its not the size of one ring, so it's too small. So I'm thinking of getting them separated and worn separately.